MARGARITA WITH A STRAW pisses me off. It pisses me off because this small gem is the sort of film that should be getting all the Oscar buzz and should be playing in theaters across the country and the best it’s going to get is a VOD release on Tuesday where it will have to fight to find its audience. On the other hand I’m hoping that because you’re a reader of Unseen Films and are actually looking for an off the radar film, that my recommendation will get you to see the film and then you’ll tell everyone you know who will then tell everyone they know and so on and the film will find the audience it deserves. The film tells the story of Laila a young woman with cerebral palsy, who leaves her home in India and comes to New York to study. The trip opens her up to who she is inside and even gives her the possibility of romance. It is utterly charming and magical and the sort of film everyone needs to see. That he film works is due to a combination of the script which gives us real characters to interact with and the cast which brings them to life. I adore these people. I love that no one seems like a construct or there to fill a plot need. Everyone feels real, as if they are playing themselves. This is one of those films that I really can’t say anything about because there is nothing to say. You just have to see it. This is one of those films where the best you can do is get a stack of tickets or DVDs or something and press them into the hands of everyone you know. “Just see this” is all one can really say because whatever I say is going to pale by what you’re going to feel when the movie ends. When I got to the end and I saw the final image I got all misty. Not saying what it was but it made me tear up in the very best way. 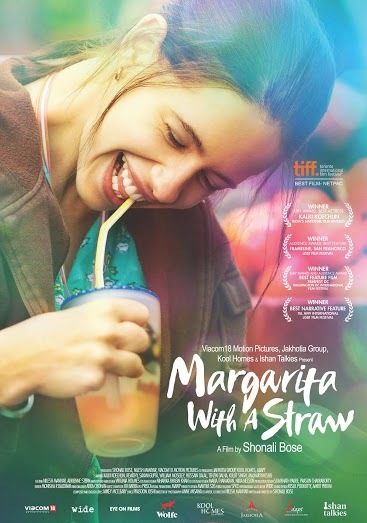 MARGARITA WITH A STRAW will be released on VOD via Wolfe Video on June 14th across all digital platforms including iTunes, Vimeo On Demand, and WolfeOnDemand.com, and will be available June 28th on DVD via Wolfe Video and many major retailers. Margarita with a Straw final trailer (long version) from Wolfe Video on Vimeo.